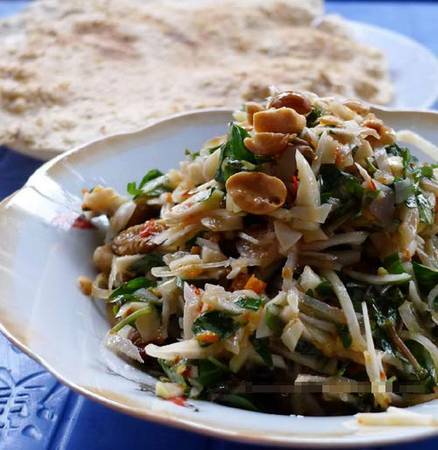 Mixed young jackfruit salad is a simple but appetizing snack in Da Nang. This dish in Pham Van Nghi shop is favored among young teenagers because of its strange taste. Why Mixed young jackfruit salad - Pham Van Nghi is special ? Mixed young jackfruit salad - Mit tron is one of the must try snacks when traveling to Danang City. Normally, the jackfruit used in most jackfruit salad versions are the young, unripe jackfruit, therefore having the term “non” in the title of the dish. “Non” means tender or young. The flesh of the young jackfruit is mild in flavor. For a vegetarian version, you can replace the shrimp and pork for strips of fried tofu.